Ancient Egyptian religion was based on polytheism, totemism, animism, anthropomorphism and fetishism. The Egyptian gods for the Egyptians represented the personification of the surrounding nature. All the natural events that the Egyptians did not understand they attributed to gods. The Egyptians believed that the gods created the entire universe and themselves. They also believed that gods ruled over the Egypt before the people even existed and after they got tired of being ruled, the gods created people. They gave all authority to Pharaohs whom the Egyptians considered as the direct descendants of the gods. Egyptian religion was based on totemism, belief in totems in the form of sacred animals and beings. Deities were usually characterized in the form of the human body and head of the animal (anthropomorphism) and this believed was usual in Egypt until the Amarna period and new concept of the ancient Egyptian religion introduced by pharaoh Akhenaten (Amenhotep IV). According to the orders of Pharaoh Akhenaten, the old temples were closed, and a new city Amrana was built where the solar deity replaced the old gods. It is also interesting that the Egyptians did not have only one myth about the origin of the world and the gods. As religious centers existed, myths about the origin of the world were changed as well. The most important religious centers were the cities of Thinis, Thebes, Memphis, Hermopolis and Heliopolis. The Egyptians have called Sun by the name of the god Khepri a primordial god who carried a spur of life which emerged from the chaos of an unprecedented watery mass called Nun. The sun at noon the Egyptians personified as the god Ra and the sunset was the personification of the god Atum. Atum was deity who finishes the day and in the morning he awoke in the form of Ptah. Ptah was Atum’s father and according to mythology in Memphis, Ptah was the creator of the world. Amon Ra, or supreme deity, is actually a god in three figures, or in three stages of his life. The supreme deity of the Nile River for Ancient Egyptians was Hapy. They worshiped this god all over Egypt by throwing food into the river and they represent him with blue skin. The god Hapy was presented as a man with blue or green beard and within female chests, suggesting his power to feed people. As a god of the northern Nile, he carries papyrus plants. On his head as the god of the southern Nile he carries lotus plants. Sometimes Hapy was painted on the temples carrying two plants and two vases which symbolizing Upper and Lower Egypt. Hapi was presented as one of the four sons of Horus. Hapi is the Egyptian god of death. He was with the head of hamadryas baboon and he was connected to Nebthet (Greek- Nephthys) or “Lady of the House”, the goddess of the tombs. Nebthet protects the mummy’s and Hapi helping her. Hapi was just an alternative pronunciation of the Nile River deity Hapy. Hapi was often replaced with Hapy, the god of the Nile, for a spell but the difference between these two deities should be distinguished, because Hapi was son of Horus and god of death. Along with Hapi, three more Horus’ sons who protect mummy were mentioned (Imsety, Qebehsenuef and Qebehsenuef). Lion headed goddess Sakhmet. Sometimes she represents a warrior goddess and sometimes goddess of healing. 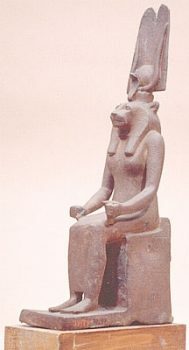 Sekhemet or Sakhmet was lion headed goddess. She is the goddess of war, fire and plague and she was angry goddess. She has a form of goddess Bastet, domestic cat. Goddesses Hathor and Bastet (Daughters of Ra) could turn into a warlike lioness Sekhmet. The Egyptians always worshiped the lioness, fearing the force and danger that she represents. Mythically, her anger was appeased by Re and she was attached to his brow in the form of the uraeus (Wadjet) in order to burn his enemies with her flaming breath. This lioness, like most of her counterparts is crowned with the sun disk and uraeus as well as the Hathor crown. Wadjet holds the papyrus (Wadj) and the sign of life. Her throne was decorated with feathers and its back has a falcon hovering in the sky. Below, a figure holds the budding fronds in its hands to signify eternity. Generally speaking, lioness goddesses appeared under different names in different periods and locations. Their relationship with various gods is rather complex, but whatever their name maybe, they usually symbolized protection against invaders or enemies. Sekhmet appears in myth about the persecution of people from the desert. Wadjet and Nekheb were the goddesses of the “Mighty”, and their task was to guard Pharaoh. Wadjet and Nekheb were twins, daughters of Ra. Wadjet (also known as Wadjit, Uto, Edjo and Buto), was goddess in the shape of cobra. According to myths Wadjet came from the snake of the goodness Isis. 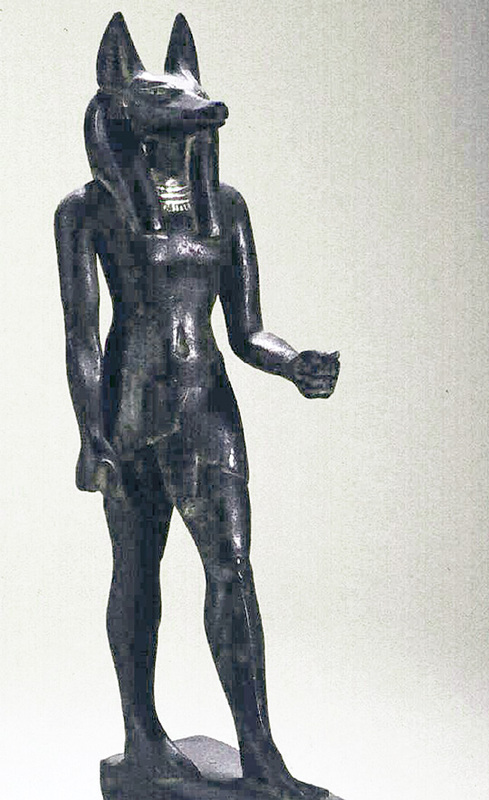 Wadjet protected the Lower Egypt, wearing a red crown. The snake was supposed to bite Ra while he slept. Pharaoh was wearing the character of both goddesses (Wadjet and Nekheb) on his head, in order to protect him. Amon is depicted in human form, sitting on a throne, wearing a large crown of his head, probably of bird feathers, pointing to him as the god of wind and air. One of the important gods in the Egyptian pantheon whose temple at Karnak (the best surviving religious complex of the Egyptian New Kingdom). 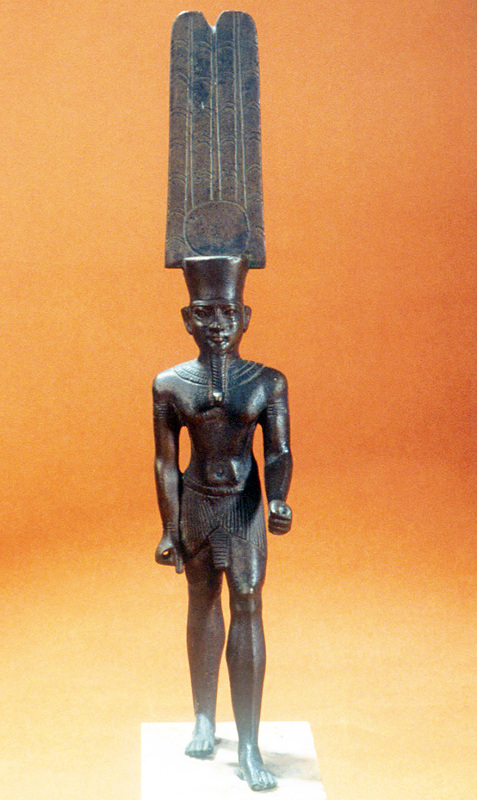 Amun, Amon or Amon Ra was a local god of Thebes. Amun probably means ”the hidden one”. He was usually represented as a human figure wearing a double- plumed crown, sometimes with a ram’s head. In Greek mythology Amun was equal with their supreme deity Zeus. The name of Amun appears for the first time in the Egyptian historical sources as ímmn, which in the Egyptian language means hidden. At the beginning of the time there was only ocean Nun. According to the myth of Hermopolis, Nun had his wife Naunet. From Nun there was a hill, and Amon was created on it. In Hermopolis Nun, Naunet, Amon and Amaunet worshiped as “fathers and mothers who existed before the gods”. Soon Amon became “the king of the gods,” and this myth mostly spread during the period of New Kingdom. Amon was mostly worshiped in Karnak and Luxor. All Pharaohs wanted to show their devotion by building halls with pillars in the form of papyrus. The Amon priests were the owners of the rich treasuries, because the Pharaohs donated gold and silver as a sacrifice to Amon, and the gold and silver was appropriated by the priests. Temple of Amon was closed during the reign of pharaoh Akhenaten. Gradually, as Amon was the god of air, he was associated with the breath of life. The Pharaons thought that if their military campaign was successful it should be thanks to Amon. Anubis was in Egyptian mythology god of the dead and ruler of the underworld, closely associated with embalming and mummification. Anubis was usually represented in form of a seated black dog or a man with a dog’s head or jackal. He wore a ceremonial tie or collar around his neck and held a flail or Sekhem. Anubis role was to guard necropolis. In Egyptians texts the name of Anubis was written as Inpw but ancient Greeks adapted the name to their language. Anubis is depicted in funeral contexts, showing how he visits a mummy or sits on a grave in order to protect mummy. According to myths Anubis was the illegitimate son of Osiris and Nephthys (Nebhtet). When Osiris was killed, Anubis made mummy from his body and this was the first mummy. His father was originally Ra in many papyrus’s found in the pyramids, and Anubis would be the fourth son of Ra. But at a later age, in myths his father became Osiris. Anubis was often described in the Books of the Dead as a god who has performed the measurements of the hearts of the deceased and the mother of the truth (Ma’at) in the presence of the Thoth (as a writer, record the result) and Osiris (as a judge). Bastet was a cat goddess and local deity of the town of Bubastis (Arabic- Tell Basta). 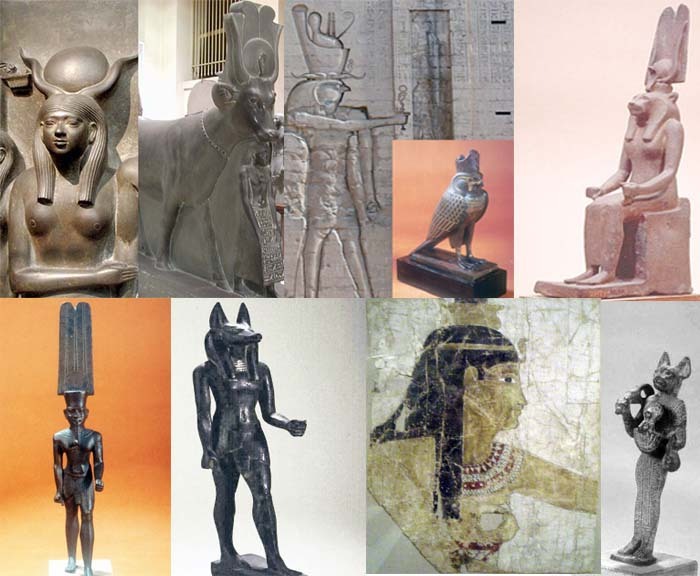 Bast, Bastet or Ubasti was almost represented as cat headed. Bastet was originally a lioness goddess very early associated with Sekhmet. During the period of Middle Kingdom she was identified with” Hathor” goddess of joy, music, dancing and later with Amuns wife. In Lower Egypt she appears particularly in the form of a cat. From the period of the Middle Kingdom the cat appeared as Bastet’s sacred animal. At the later stage in New Kingdom the sacred cat was depicted as woman with a cat’s head (bastet). 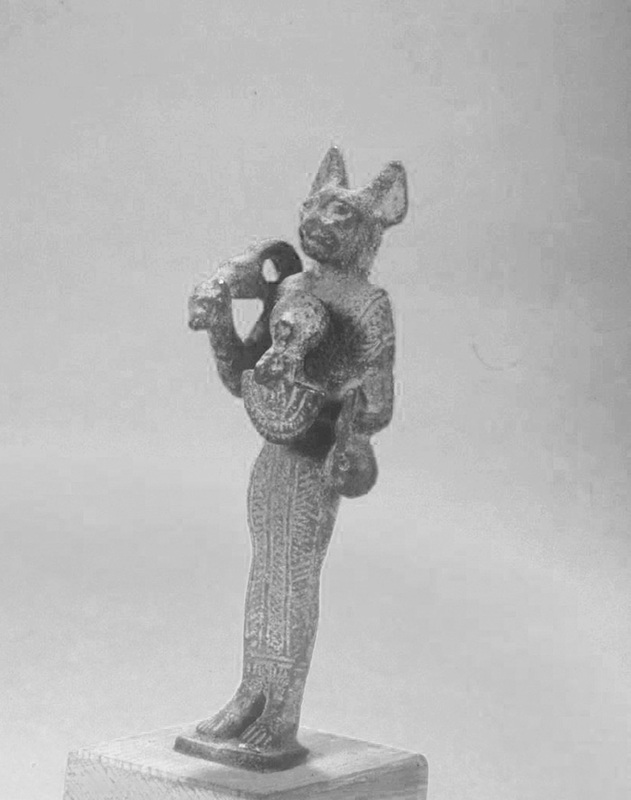 Bastet carrying a sacred rattle and a box or basket and sometimes accompanied by a small group of kittens. Cemeteries of cats have been excavated not only at Bubasts but also at other sites in the Nile valley at Luxor, Saqqara ’the necropolis of Memphis’. Due to the fact that domestic cats are protective and gentle towards their offspring, Bast was also considered a good mother. The woman who wanted the children, sometimes wore a pendant showing the goddess with kittens (the number of kittens on the pendant was the number of children the woman wanted to give birth). Because of their ability to kill rats and snakes, especially cobras, cats in Egypt were considered to be exalted. 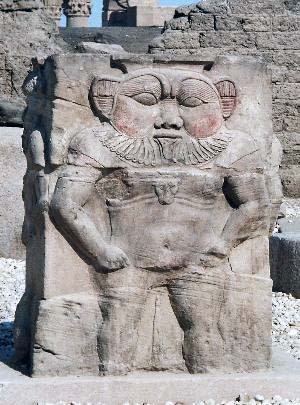 Relief of the ancient Egyptian god Bes from the Dendra Temple. Bes was a god of joy, music and dance. It is a small smiled freak that looks completely different compared to any other god of the ancient Egyptian mythology. The Bes was most similar with some of the gods of African mythology. This god was very popular in ancient Egypt and people usually made lot of small figurines of the Bes. Bes was also a god of magic who helped womans to give birth. The Egyptians thought that Bes feared and expelled all demons from house. Hathor (original ḥwt-ḥr) in Egyptian mythology was the goddess of love, beauty, music and happiness. Hathor was presented in the shape of a woman with cowhorn or a hieroglyphic sign on her head. Compare to Greek mythology, Hathor was essentially Aphrodite. 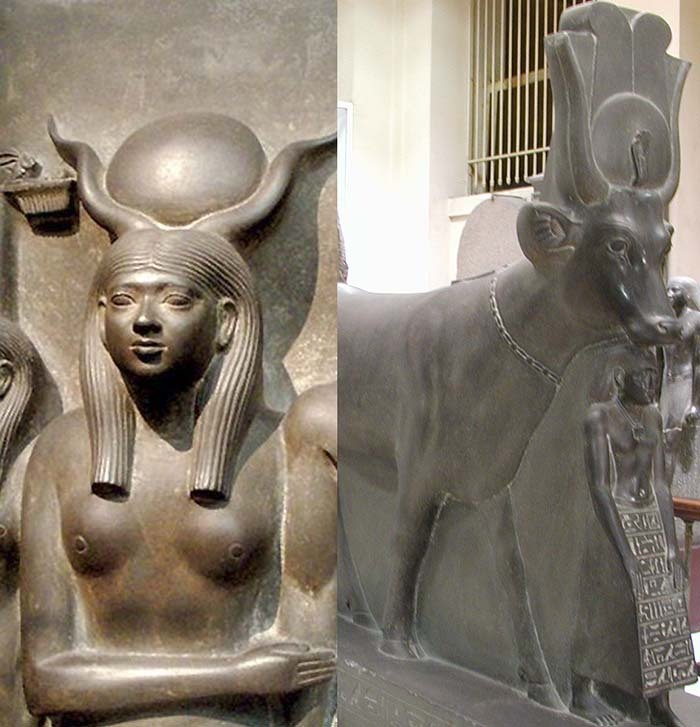 Hathor was a magician that sometimes appears in the form of a cow. In Egyptian mythology Hathor was born from Ra’s eye and she was favorite daughter of Ra. Hathor was also the goddess of the West and drunkenness. She was waiting for the souls of the dead in the underworld. The cult center of the goddess Hathor was Dendera. In Memphis, she was worshiped as the goddess of the afterlife, offering the deceased with drinks and food. 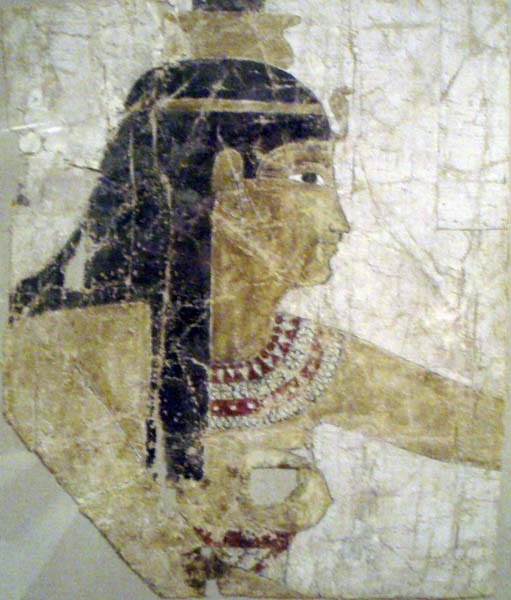 In Thebes as a goddess of the West, people warship her as a patron of the necropolis. 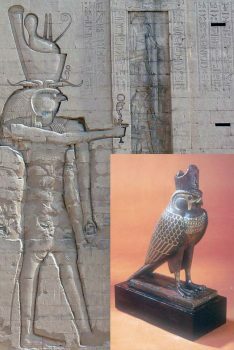 The Horus has the Shape of a hawk or falcon or in anthropomorphic shape within head of hawk or falcon. In Egyptian mythology there was two Horus. One was the son of Isis and Osiris and another one was son and hawk of Ra. Horus’s eye was called “wedjat” which means healthy. In a conflict between Horus and Seth, Horus remains without one eye (the symbolism of the eclipse). But Horus achieved victory over Seth, and he offers his own eye to Osiris. Horus’s eye in Egyptian mythology considered as popular amulet of medicine. It was believed that eye of Horus “wedjet” able to restore and heal the sick body parts of people. Therefore, it was frequently used as an amulet. At the same time, wedjet had the role of magic protection against bad influences. In Egyptian mythology Isis was a goddess of fertility, love and medicine. The Egyptians believed that every year Isis was crying and that’s why the Nile River floods. Her shrines were located in Giza, Abydos and Philae. Isis wears a red dress, she has dark hair and holds a stick in her hand. The goddess was depicted on the walls of temples and statues. She wears a sign for the throne on her head. According to myths Geb as god of the earth and his wife Nut as the goddess of Heaven, had four children: Osiris, Isis, Seth, and Nephthys (Nebthet). 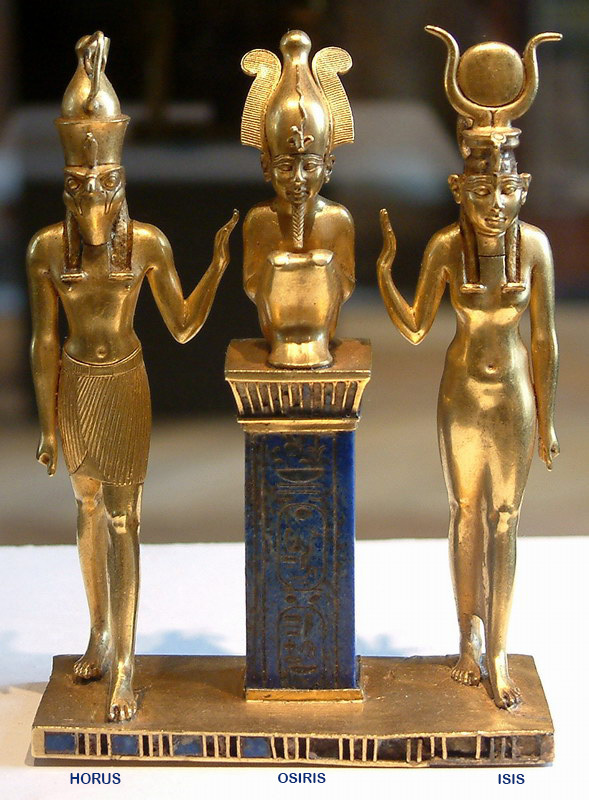 Osiris married Isis and Seth married Nepthys. The Seth and the Nephthys did not have a children, so unsatisfied she went to Osiris and slept with him. She gave birth to a goddess Anubis and she dismissed him because she looked ugly but Isis accepted Anubis. Set became jealous and he killed Osiris. Isis and Nephthys sought out all the body parts of Osiris and revived their brother. During the New Kingdom Isis was equal to Hathor and Egyptians worshiped Isida-Hathor mostly in Dendera. Osiris was the Egyptian god of fertility, abundance, vegetation, and later the underworld. In Egyptian mythology Osiris death and resurrection symbolize the change of the seasons. Osiris was worshiped throughout Egypt, and the most famous sanctuary of Osiris was city Abydos in Upper Egypt. It is pictured in anthropomorphic form in a standing or sitting position on a throne. Osiris’s face is depicted in green, which shows that he died, holding a pharaoh’s stick in his hand. The cult of Osiris penetrated into Greece at the time of Alexander the Great in a form of the Greek god Dionysus, and in Rome at the end of the Roman Republic. The cult of Osiris has connection with Greek mythology about the god Dionysus, because Dionysus also had two lives. In Egyptian mythology Seth was the god of the desert, storm, darkness, chaos associated with all the strange and terrible events. His others names were Suty, Sutekh, and Setesh. Set was the son of Geb (the Earth) and the Nut (goddess the desert). He had sisters Isis and Nephthys, and his brother was Osiris. He was considered to be responsible for earthquakes, solar eclipses and storm. The most strange was his head, representing a wolf, ants, donkey, or an unknown animal. His nephew Anubis have very similar head. He was protector of the Upper Egypt. Only the major deities of the ancient Egyptians were depicted in this article. The pantheon of the ancient Egyptian gods was much larger.